SNES Mega Man X (USA) "100%" in 33:48.86 by Hetfield90. Originally thought to be an April Fools joke, it turns out that Capcom really did hide a one-hit-kills weapon in Mega Man X. 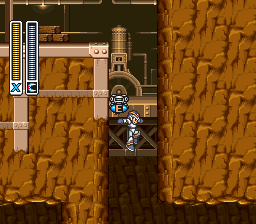 That platform in Armored Armadillo's stage always did seem a little strange. Unlike the later games, collecting the Hadoken is much more time consuming compared to the ability to obliterate the mandatory Reploid rematches and fortress bosses. Nevertheless this run is still faster than the first any% run ever published. Hetfield managed to improve the previous run by 10 seconds, although the actual improvement is roughly 22.2 seconds, and most of it was lost because of the use of a more accurate emulator. If you want to see more of the blue-clad hero, we recommend watching the any% run.